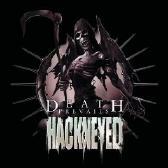 Neophytic German metal troupe Hackneyed play with the deathcore style sharply in focus on their nine-track disc "Death Prevails." Undoubtedly heavy yet lacking development in spots, this act -- whose median age is merely 16 -- have drawn from extreme metal's elite to compose a rough-around-the-edges sonic battering on cuts like "Gut Candy" and "Axe Splatter." Liberal in their use of technical death metal elements and gore metal imagery, this band's debut is a remarkable effort when considering their age and experience and will definitely appeal to those into Suicide Silence and Job for a Cowboy as well as old schoolers who remember the warmongering of Bolt Thrower. For more information, check out http://www.hackneyed.de.